Empower Tehama, formerly Alternatives to Violence, was founded in 1994 as a grass roots response to women and children hoping to escape abusive relationships. At the time of its inception, the name Alternatives to Violence concisely captured the organization's services. Since then, the organization's services have expanded to encompass additional programs that target audiences that find the name Alternatives to Violence a barrier to participation due to the stigma associated with violence. To better serve the community of Tehama County while continuing to expand and attract new audiences to their services and programs, Alternatives to Violence needed a new name and brand identity that would better encompass their programs and services and enable growth. Solsken was asked to develop a new organization name and brand identity that would propel the organization forward. Alternative to Violence's new name and brand identity must be inclusive of all audiences, strongly resonate with the community of Tehama County, capture the organization's current and future services, and position the organization for future growth. To understand the organization, its needs and the community it serves, Solsken met with key staff, board members and community leaders and conducted one-on-one interviews. Solsken also conducted data mining and independent research sessions to collect information on names that would resonate with the industry and diverse audiences, pulling test subjects who are both familiar and unfamiliar with the types of services offered by the organization. The name Empower Tehama was developed and emerged victorious. However, selecting a new name for the organization alone was not enough. To accompany the new name, Solsken also developed a new brand identity to compliment the organization's mission and enable it to expand and reach new audiences. On March 22, 2018, Alternatives to Violence officially rebranded to Empower Tehama with a ribbon-cutting launch event, attended by 100 key community leaders, board members and organization supporters. The rebrand garnered local media attention with features on KRCR News Channel ABC 7 and Red Bluff Daily News as well as support in 167 national outlets reaching a potential audience of 12.2 million. Domestic violence, specifically victims who suffer abuse, seldom discuss their experiences publicly. There is a distinct stigma associated becoming a victim and the topic, in most circles, is regarded as taboo. By researching, utilizing tried-and-true marketing tactics and spending time with the organization to uniquely identify their wants and needs, Solsken successfully developed and delivered the ideal name and brand identity to propel the organization forward. By changing the organization name from Alternatives to Violence to Empower Tehama, Solsken successfully addressed the client's concerns by removing the implicit association with violence and victimization and replacing it with a positive, uplifting association that embraces the community. 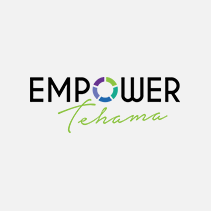 Empower Tehama is inclusive, uplifting and welcoming to all audiences in Tehama County.